Whether you call them dam doughnuts, jelly donuts, sufganiyot, sufganiyah, Hanukkah bread these are delicious deep fried treats. Traditionally filled with sweet jam and dusted with powder sugar. 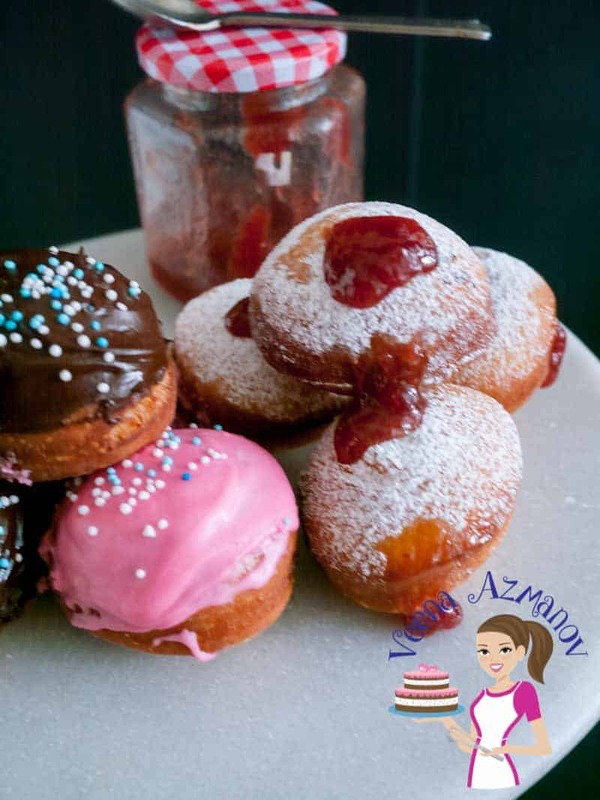 This simple, easy and effortless recipe for jam doughnuts will have your kids asking for them all year round. Strawberry jam is traditional but raspberry or apricot is quite a treat as well. In a cup or bowl - add warm milk, yeast, and one tablespoon sugar. Stir well and set aside for five mins to foam. When formed up (about 3 to 5 mins) - add the egg, remaining sugar and vanilla. In a larger bowl or mixer with hook attachment. Add flour and salt - mix to combine. Mix on medium speed scraping the sides of the bowl as needed. Once all the flour is mixed in - knead for 2 minutes on medium-low speed (or with your hands for 5 minutes). This is a soft dough so do not be tempted to add more flour. Then add the soft butter. Knead for 3 minutes more on medium speed. By this time the dough will still be soft and elastic but less sticky and shinier. Place the dough in an oiled bowl, cover and let rise until double in volume for about 45 minutes. Once double in volume and chilled - invert on a floured surface. Divide the dough into 14 to 16 portions - (roll into a log then cut the log in half, then half again until you have 14 to 16 portions). Roll each portion into a ball and place it on a flour dusted parchment paper to prevent sticking. Once all the balls are rolled - press with your palm on top of each to flatten it slightly. This will make sure it becomes a doughnut shape rather than a ball shape. Tip - Always make one or two mini doughnuts for the purpose of testing oil temperature. Cover with a damp kitchen cloth and let rise again for 30 minutes in a warm place. Heat cooking oil in a pot or fryer to about 325 F.
Tip - ideally, you want the oil hot but not so it will brow the doughnut instantly. These need to be cooked thru before they brown. You need enough oil so the doughnuts will float in them. Add a mini doughnut to test the oil. Once the oil is ready - add two or three doughnuts at a time. Do not crowd the pan as the temperature of the oil will drop/cool down too fast. The doughnuts should rise in 30 secs as they puff. Let cook for 30 seconds before you flip so it can continue to puff on the other side. Cook for another 30 seconds on the other side and again. Place jam in a piping bag with a piping tip for easy use. You can let the doughnuts cool completely before you fill with jam. 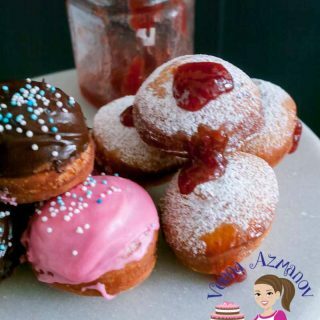 I prefer to fill them while they are still warm so the jam melts and spreads inside the doughnut.